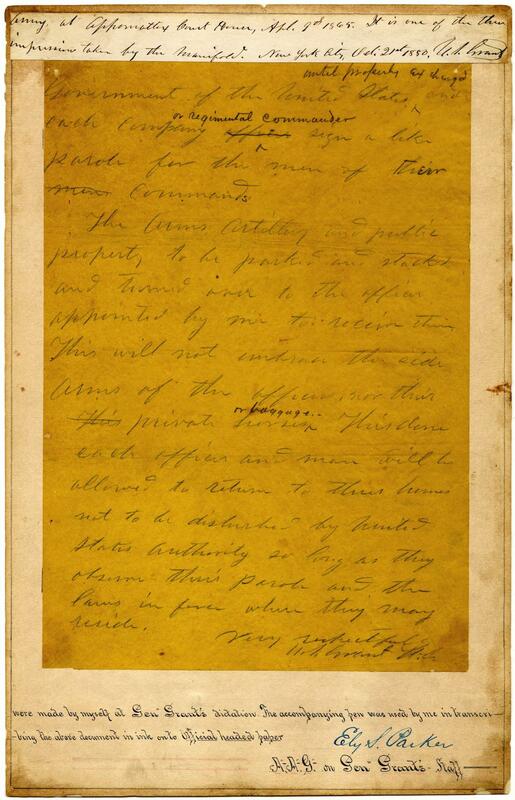 Surrender at Appomattox: Grant’s surrender terms drafted by Ely Parker. 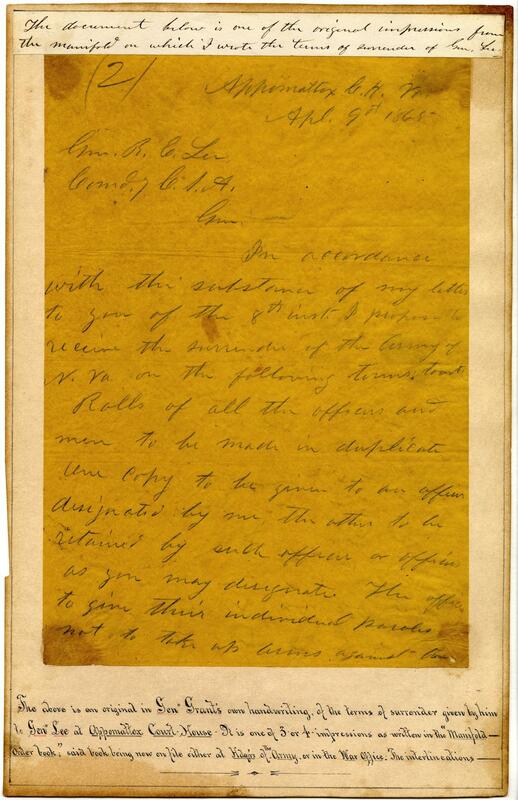 This original draft of Grant’s surrender terms was preserved by Ely S. Parker, a Seneca Indian engineer with legal training who was an assistant adjutant-general on Grant’s staff. Parker was present at the surrender and provided Grant with a manifold book (a cousin of the carbon copy notebook, which yielded three duplicates of handwritten documents) to use in composing his terms. This yellow draft copy came from that book. Mariam Touba, reference librarian at the New-York Historical Society, writes in a post about this document that the job of copying draft terms onto official letterhead fell to Parker after Grant’s adjutant “was too shaken by the magnitude of the occasion to complete the assignment.” Grant completed a draft, and then Parker noted in his own handwriting between the lines the changes that the general wished to make in the final version. Parker preserved this first draft, affixed it to a larger sheet, and got Grant to attest to its authenticity 15 years later, attaching his handwritten testimonial along the top. Along the bottom, Parker told the story of the document, in his own painstaking handwriting. Courtesy of the New-York Historical Society. In accordance with the substance of my letter to you of the 8th instant, I propose to receive the surrender of the Army of Northern Virginia on the following terms, to wit: Rolls of all the officers and men to be made in duplicate, one copy to be given to an officer to be designated by me, the other to be retained by such officer or officers as you may designate. The officers to give their individual paroles not to take up arms against the Government of the United States until properly exchanged; and each company or regimental commander sign a like parole for the men of their commands. The arms, artillery, and public property to be parked and stacked, and turned over to the officers appointed by me to receive them. This will not embrace the side-arms of the officers, nor their private horses or baggage. This done, each officer and man will be allowed to return to his home, not to be disturbed by U. S. authority so long as they observe their paroles and the laws in force where they may reside.